If you love rich flavours, this recipe is for you. 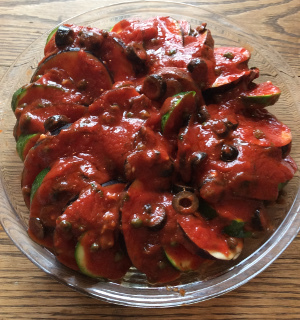 It is really quick and easy to prepare and you need just a few ingredients. 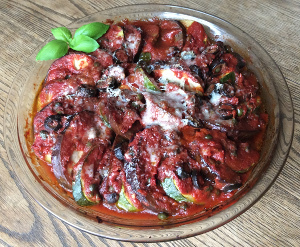 This dish is similar to aubergine parmigiana, and just as tasty, but much lighter. The flavours of the olives, capers, tomato, and Parmigiano cheese blend perfectly with the sweetness of the vegetables. You can use other cheese instead of Parmigiano (such as cheddar, mozzarella cheese). 1 baking dish, 1 medium saucepan, 1 knife, 1 strainer. 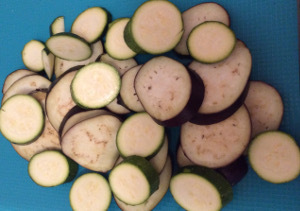 Wash courgette and eggplant thoroughly, cut off the ends and cut into slices (about 1 cm thick). 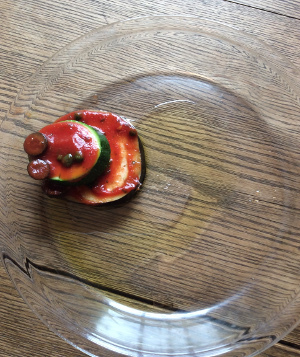 Put the eggplant in a dish (or a strainer), sprinkle with sea salt, let sit for about 15 minutes. This takes out the bitterness. Meanwhile, prepare the sauce. 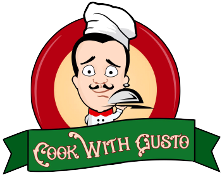 Put 2 tablespoons of oil in pan, heat and add garlic. 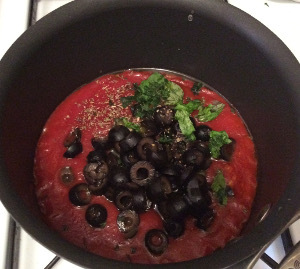 Add the tomato puree, capers, olives, basil, and oregano. Add salt only when the sauce is cooked. Simmer over medium heat for about 10-15 minutes. 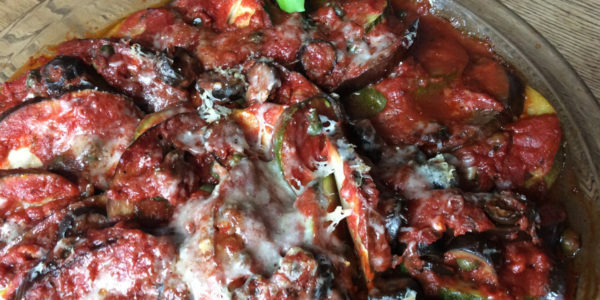 Place one slice of aubergine in the pan and pour a tablespoon of tomato sauce over it. 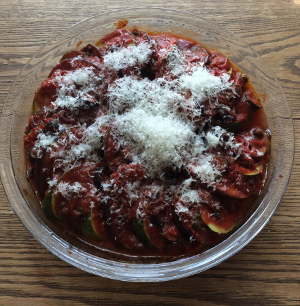 Place one slice of courgette on the previous aubergine, repeat with tomato sauce. 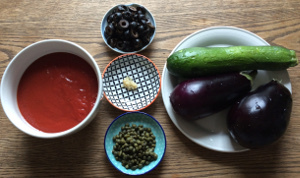 Go ahead until you finish alternating the slices of aubergine and courgette. Arrange in a spiral shape. Pour the remaining sauce over vegetables. 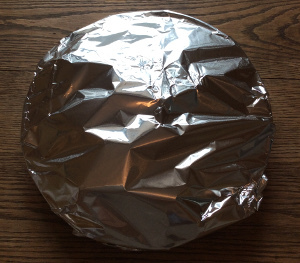 Bake for about 20 minutes; then, remove the foil and sprinkle some grated Parmigiano cheese on top. Bake for another 25 minutes. 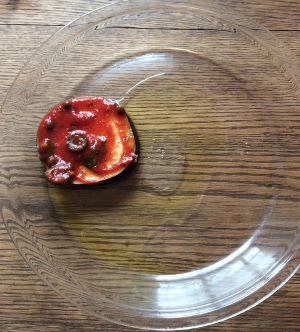 Add extra virgin olive oil if needed and garnish with basil. Let rest a few minutes before serving. You can prepare this recipe in advance because it is even better the next day! 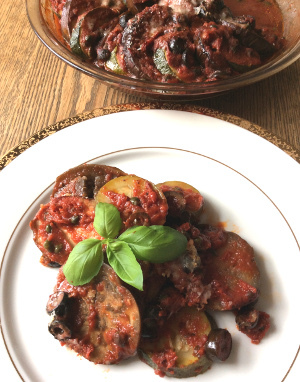 The vegetables will absorb the tomato sauce and gain flavour after resting.